'Among the many gripping tales of travel and exploration the tale of Alexander Gardner is surely one of the most extraordinary. Master storyteller John Keay deftly sifts truth from myth-making to uncover fascinating new evidence, revealing an amazing tale worthy of Kipling or Flashman of a life lived further out on the edge than most could even imagine' MICHAEL WOOD Like the travels of Marco Polo, those of Alexander Gardner clip the white line between credible adventure and creative invention. Either this Scots-American is the nineteenth century's most intrepid traveller or its most egregious fantasist, or a bit of both. Contemporaries generally believed him; posterity became more sceptical. And as with Polo, the investigation of Gardner's story enlarged man's understanding of the world and upped the pace of scientific and political exploration. Before more reputable explorers notched up their own discoveries in innermost Asia, this lone traveller had roamed the deserts of Turkestan, ridden round the world's most fearsome knot of mountains and fought, as the first American in Afghanistan, 'for the good cause of right against wrong'.From the Caspian to Tibet and from Kandahar to Kashgar, Gardner had seen it all. At the time, the 1820s, no other outsider had managed anything remotely comparable. When word of his feats filtered out, geographers were agog. Historians were more intrigued by what followed. After thirteen years as a white-man-gone-native in Central Asia, Gardner re-emerged as a colonel of artillery in the employ of India's last great native empire. 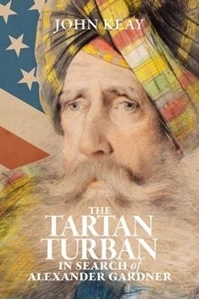 He witnessed the death throes of that Sikh Empire at close quarters and, sparing no gruesome detail, recorded his own part in the bloodshed (the very same featuring as the exploits of 'Alick' Gardner in the 'Flashman' series). Fame finally caught up with him during his long retirement in Kashmir. Dressed in tartan yet still living as a native, he mystified visiting dignitaries and found a ready audience for the tales of his adventurous past. But one mystery he certainly took to the grave: the whereabouts of his accumulated fortune has still to be discovered.Using much original material, including newly discovered papers by Gardner himself, this investigative biography by John Keay, bestselling author of India: A History, takes the reader on a quest from the American West to the Asian East to unravel the greatest enigma in the history of travel.